Incom T-65 Starfighter – "X-Wing"
This page was part of the April's Fool Day of 2015 and is now archived. Most information displayed here are a collection of the two pages listed at the bottom and our wild imagination. So take everything with plenty of salt, or better do not, it's bad for your heart. When the citizenry of the Empire thought about the Rebel Alliance, thisfighter was often one of the first pictures in their head. The X-Wing has become the mainstay of the rebel alliance although the Y-Wing still holds the record for the most TIE Fighters destroyed. This is simply because the Y-Wing has been in service so much longer than the X-Wing has been. The X-Wing is the favorite among many Rebel pilots. It is fast, very maneuverable,and is heavily armed. Like the Y-Wing and unlike most imperial fighters, it has a hyperdrive to travel from system to system. What is interesting is that, even though it is not a bomber, the X-Wing holds the records for the largest single ship destroyed by a fighter and the most tonnage destroyedby any ship class including capital ships. This is due to the X-Wing Red-5 destroying the first Death Star. Unlike the Y-Wing, the X-Wing has a very sleek shape. The whole fighter is needle shaped with two wings on either side of the fighter. The pilot's cockpit is about one third from the aft end of the fighter. If the pilot has to eject, the top of the cockpit is blow off and the pilot ejects outof the top of the fighter. Directly behind the pilot is the compartment is the socket for astromech droid. Behind the droid are the power systems of fighter. The fighters has four ion engines with two on either side body of the fighter and act as supports for the wings as well. The laser cannons are on the outside end of the wings. Since the fighter is far more aerodynamic than the Y-Wing, it operates far better within an atmosphere and that wasone reason for the way the fighter was designed. The wings are also known as S foils. They have two modes, travel which the wings are together and attack mode which the wings are split into an X pattern. The guns cannot be fired when the S-foils are in travel mode, but the fighter cannot make a normal landing when the wings are open. Where to start? Excellent range, speed and firepower, but lack of maneuverbility and low speed acceleration. 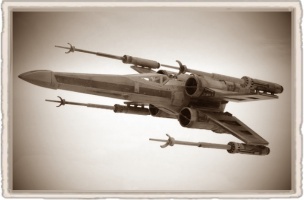 The X-Wing is for a fighter very heavily armed and armoured. The "Defender" deflector shields will absorb most auto-blaster damage and prove themselves useful even against laser cannon fire. Following this the T-65 should be used in an aggressive strike role, getting in, destroying the target and getting the heck out of there. With the speed at hand even dogfights against more nimble vessels are no problem, while tedious an "hit 'n run" tactic works wonders and even better with a wingman to keep the enemy under constant pressure and low relative speed. Against bigger ships than fighters, the T-65 can truly shine. Heavy frontal deflector shields and a pair of MG7 torpedo launchers can even deal with the most heavily armoured vessels. Especially destroyers and cruisers need to fear those speedy and sneaky strike starfighters, even more so when not equipped with defensive auto-turrets. However, ship-classes greater than cruisers (like Imperial Star Destroyers) often possess their own interceptor fighters and always on alert squadron crews in addition to their usual impressive auto-fire artillery systems. Proceed with caution and in aid of several squads to securely take on of those big boys down. Compared to its main adversary in the Galactic Civil War the TIE-fighter, the T-65 posses far greater range thanks to the interstellar jump drive. When in a pickle just jump out of the system with the help of pre-saved coordinates in the droid. In close combat the X-Wing's heavy mass is a sincere problem which can be overcome by careful attack planning, yet the main adversary will remain with an edge in turn fights. Top speed is where this beauty shines. In addition the powerful deflectors allow for easy head-on tactics against the Imperial counterpart which main disadvantage is the defensive and offensive power equipment. The aerodynamic appeal is not a lie and outclasses the TIE fighter in atmospharic dogfights which has to rely on its deflector shields to even be able to fly properly. The fighters laser cannons are individually slightly less powerful that those on the Y-Wing but since there are four mounts instead of two, the overall ability to inflict damage is greater. It takes very few shots to destroy a Tie fighter with the laser cannons. The fighter carries less Proton Torpedoes than the Y-Wing carries but still has two launchers with four torpedoes each. The Torpedoes are the equivalent of long range missiles in Rifts. These torpedoes are the main weapon normally used against larger ships but can target other fighters, if needed. These cannons are mounted on the outside of the fighters S-Foils (or wings) and fire forward. The cannons are slightly less powerful individually than those mounted on the Y-Wing but due to the fact that there are four cannons, the cannons are cable of inflicting more damage. When these guns are compared to those of most fighters in Phase World, they are about equal to them. The cannons can be fire individually,in pairs, or all four simultaneously. The weapon systems cannot be used in hyperspace. Able to perform quick 180° turns these smart projectiles are not made of simple matter as the name states, but rather are the most prolific and advanced rocket weaponry known to the 'Verse. After the lenghty lock on procedure these warheads can even be used against fighters, usingly dooming the target without defensive armament. More bang for your buck? Well, then you are wrong here. Those rockets are rare and expensive, but they surely bang loud (as loud as you can in the silence of space, of course your cockpit sound module will produce the feared "silence-bwroom" effect upon detonation). Against cluster of lightly armoured enemies this missile type is more than deadly, like it was designed to be used against them. Upon contact with the warhead will penetrate and explode. If set to proximity detonation the explosion's 'shockwave' will hit the target with kinetic energy of its 'sonic blast'. Getting an upgraded Astromech greatly increases this fighters true strenght: Range. Having upto ten saved locations eases in shaking off enemies and allows for more in depth combat tactics. The upgrade to the 'KX9' lasers is well advised even though the 'IX4' are enough bang against fighters, but against cruiser subsystems KX9 does the punch. An interesting upgrade choice are the 'Concussion rockets'. The great area of effect can be devastating to formation flight of fighters, but they are rather expensive and difficult to mount on the T-65. he X-wing was originally designed by Incom Corporation for the Empire by Vors Voorhorian, but the entire engineering team defected to the Rebel Alliance with the prototypes hidden on Fresia. It was directly descended from the old Z-95 Headhunter, built by Incom and Subpro, with lessons learned from the ARC-170 starfighter. After four prototypes were extracted from Fresia during the Battle of Fresia, it first encountered Imperial forces in the Battle of Turkana. Many more of the ships were liberated from an Incom assembly facility prior to the Battle of Yavin. Besides its usage by the Rebel Alliance, a Starfighter volunteer squadron by the name of the Lightspeed Panthers utilized several customized T-65 X-wing starfighters against several TIE/LN starfighters during the Fei Hu campaign, and demonstrated the fighter's superiority by taking down 286 TIEs within 9 months while only losing 4 of their own X-wings. This eventually led to the development of the TIE/IN interceptor and, later, the TIE Hunters. Famous uses included the Battle of Yavin, where an X-wing piloted by Luke Skywalker destroyed the Empire's first Death Star, although nearly all the other X-wings that participated in the battle were destroyed. An X-wing piloted by Wedge Antilles also helped destroy the second Death Star's reactor at the Battle of Endor, in concert with the Millennium Falcon, starting off a chain reaction that completely destroyed the battlestation. As the battles progressed, the Imperials, realizing they needed to counter the X-wings exactly, eventually developed the TIE Hunter, a TIE variant that possessed S-foils, proton torpedo launchers, and ion cannons. It had been intended that the X-wing series would be replaced by the E-wing approximately six years after the Battle of Endor, but initial design issues relating to the weapons placement delayed wide-spread introduction into the New Republic military. Wide-scale deployment of the E-wing did occur (most notably in Fifth Fleet), but X-wing production continued on and may have equipped fighter squadrons not "at the tip of the spear." One notable exception was Rogue Squadron, the Republic's most elite fighter squadron, which was known for its almost exclusive use of the X-wing (this all is shamelessly taken from the Star Wars Wikia, link below). Skins and camouflages for the T-65 series from live.warthunder.com. Maximum range 360 hours at max speed: 21600 l.y. This page was last edited on 30 January 2019, at 05:40.